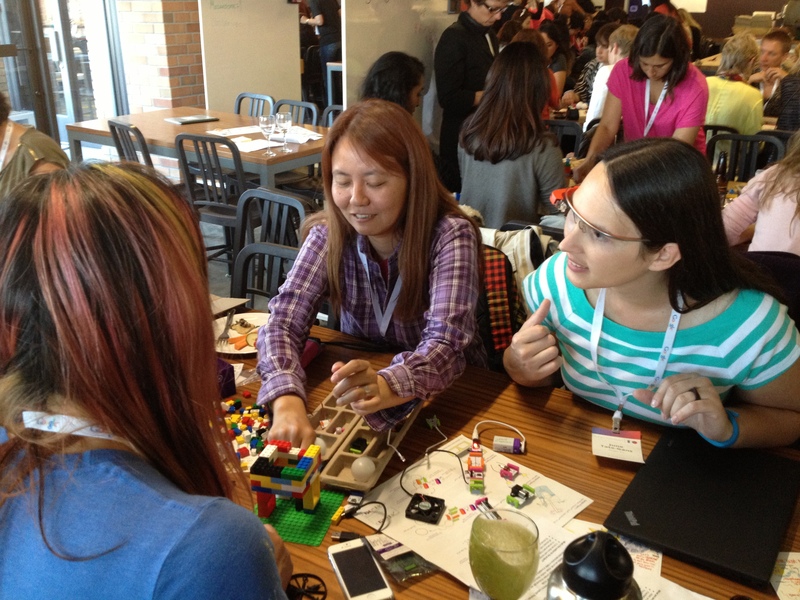 I wondered around the Google Mountain View campus today and finished up the day at the Women TechMaker event as part of Google I/O. A few people were wearing Google Glass and had the opportunity to ask for feedback about their experience and even try a pair. Here is what I captured. There seems to be 2 types of devices floating around: the general public Glass (ordered at I/O 12) and the Googlers Glass, which is still prototype and not allowed to be shared photographed or filmed (even though they look identical to the general public one). So, I met a nice enough lady, who ordered hers at I/O last year and let me try it on. The frame is very light and comfortable it is actually not at all like wearing glasses. You can easily forget that you are wearing it. The whole system is included in the frame (a thicker part at the back of the left branch). It also serves as a navigation bar. I heard before that you had to carry extra parts. This not true. All the information is stored in the cloud and pictures taken are automatically uploaded on your G+ profile (I assume this needs to be set initially). The pack that comes along with Glass doesn’t need to be carried with all the time. I think the picture didn’t work. Just like Siri, it probably needs to get used to your voice and accent (yet again, this device needs to work harder to capture the French- Australian twang) and then for the time: 9.22 lit up on the top corner of my eye. Pretty cool! Every Glass owner I talked to said they they loved it but were still getting used to it! There will be a developers sand box at I/O that should start laying framework for developing apps for Google Glass. That should make its utility expand big and fast! Glass is a new area for Google and the team wants to make sure that the experience makes people happy. The areas where it will develop are unknown, for now it’s communication, and pictures… ultimately, a lot of current experiences will move to Google Glass and take technology out of the way. The production numbers for the public are not available.